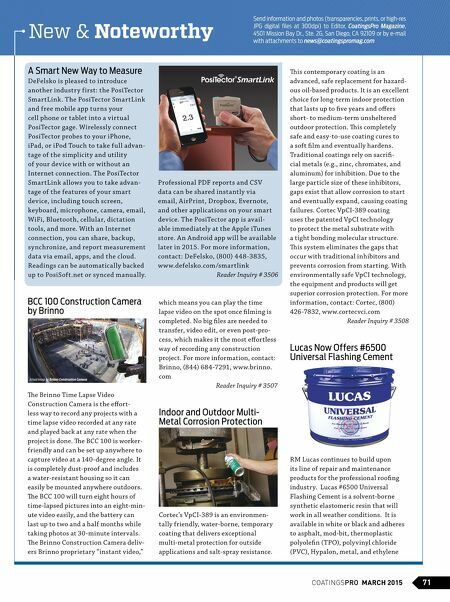 70 MARCH 2015 COATINGSPROMAG.COM Hard Work & Craftsmanship W hile some contractors say they've been in the coatings industry " forever," few were actually born and raised in the business like Shaun Geiger. W hile it may not have always been his sole focus, Geiger's life path started at his stepfa- ther's company when Shaun was just 13 years old. He worked on packaging cans of product at the epoxy-focused family business. "I had been contemplating a different career after college," said Geiger. "I really didn't intend on stay ing, but my stepfather wanted me to stay in the family business." A fter finishing his undergraduate degree, he came back to tr y his hand at sales w ith the company, primarily pitching to distributors and contractors. "I got a lot of field and technical experience out on jobsites while I was selling," Geiger explained. " T hat was the first time I thought, 'I think I could do this contracting thing,' which was something I'd wanted to do since I was young." 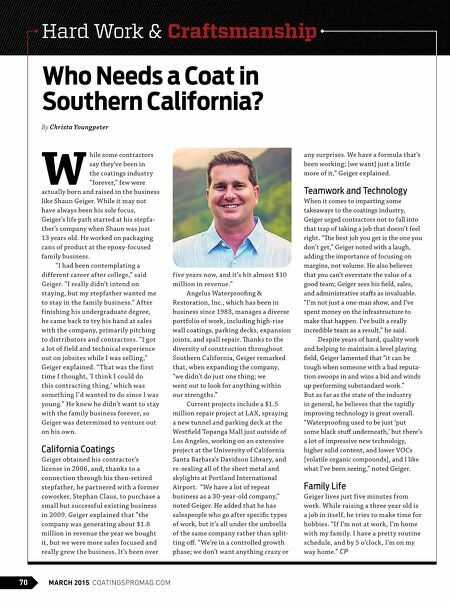 He knew he didn't want to stay w ith the family business forever, so Geiger was determined to venture out on his ow n. California Coatings Geiger obtained his contractor's license in 2006, and, thanks to a connection through his then-retired stepfather, he partnered w ith a former coworker, Stephan Claus, to purchase a small but successful existing business in 2009. Geiger explained that "the company was generating about $1.8 million in revenue the year we bought it, but we were more sales focused and really grew the business. It's been over five years now, and it's hit almost $10 million in revenue." Angelus Waterproofng & Restoration, Inc., which has been in business since 1983, manages a diverse portfolio of work, including high-rise wall coatings, parking decks, expansion joints, and spall repair. Tanks to the diversity of construction throughout Southern California, Geiger remarked that, when expanding the company, "we didn't do just one thing; we went out to look for anything within our strengths." Current projects include a $1.5 million repair project at LA X, spraying a new tunnel and parking deck at the Westfeld Topanga Mall just outside of Los Angeles, working on an extensive project at the University of California Santa Barbara's Davidson Library, and re-sealing all of the sheet metal and skylights at Portland International Airport. "We have a lot of repeat business as a 30-year-old company," noted Geiger. He added that he has salespeople who go after specifc types of work, but it's all under the umbrella of the same company rather than split- ting of. "We're in a controlled growth phase; we don't want anything crazy or any surprises. We have a formula that's been working; [we want] just a little more of it," Geiger explained. Teamwork and Technology When it comes to imparting some takeaways to the coatings industry, Geiger urged contractors not to fall into that trap of taking a job that doesn't feel right. "Te best job you get is the one you don't get," Geiger noted with a laugh, adding the importance of focusing on margins, not volume. He also believes that you can't overstate the value of a good team; Geiger sees his feld, sales, and administrative stafs as invaluable. "I'm not just a one-man show, and I've spent money on the infrastructure to make that happen. I've built a really incredible team as a result," he said. Despite years of hard, quality work and helping to maintain a level playing feld, Geiger lamented that "it can be tough when someone with a bad reputa- tion swoops in and wins a bid and winds up performing substandard work." But as far as the state of the industry in general, he believes that the rapidly improving technology is great overall. "Waterproofng used to be just 'put some black stuf underneath,' but there's a lot of impressive new technology, higher solid content, and lower VOCs [volatile organic compounds], and I like what I've been seeing," noted Geiger. Family Life Geiger lives just five minutes from work. W hile raising a three year old is a job in itself, he tries to make time for hobbies. "If I'm not at work, I'm home w ith my family. I have a pretty routine schedule, and by 5 o'clock, I'm on my way home." CP By Christa Youngpeter Who Needs a Coat in Southern California?